Hello, Fishlore! Sean here, known on the forums as "sgould". I consider myself relatively new to fish keeping, having been active in the hobby for about 1 year now. I also kept a tank for about 2 years back in my college days, but that has been many moons ago now. My interest in fish keeping actually springs from a broader love of the water and all things aquatic. I have been fascinated by the water for as long as I can remember, and have developed a lot of friendships and great hobbies as that fascination has led me to different pursuits. Two of the most fun and interesting hobbies that I have been fortunate enough to get involved with are scuba diving and fish keeping. 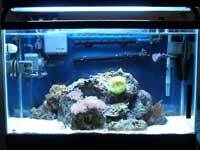 As with a lot of beginning aquarists, I started out with freshwater tanks, having been intimidated by all the stories out there of how difficult and expensive salt water tanks are. After about 4 or 5 months though, I could not resist any longer. Especially after being repeatedly subjected to photos of a lot of great salt tanks on Fishlore! So, in June, I took the salt water plunge. Today, I continue to keep both fresh and saltwater fish, and am enjoying the hobby more all the time. I am currently running 3 tanks. A 20 gallon freshwater, a 29 gallon saltwater, and a 55 gallon that I am in the process of converting from fresh to salt. A 4th tank is in the works, and should be up and running in the next couple of weeks. The 20 gallon tank is my oldest at 1 year old now. This tank started out housing Tiger Barbs and Zebra Danios, with a bristlenose pleco running cleanup duty. Currently, this tank is also serving as a temporary home for the freshwater fish taken from my 55 gallon tank while it is converted over to saltwater. These "squatters", as I'm sure the permanent tank residents see them, will be moved over to a new tank in the coming weeks. Equipment on this tank is pretty basic... standard fluorescent lights, a Whisper HOB power filter, visi-therm stealth heater, and a small air pump for a bubble disc. I do 5 gallon water changes on this tank every week, with a 10 gallon change thrown in about once every month to month and a half. Water temp is kept at 78 degrees F.
The 29 gallon tank is a saltwater reef tank that has been up and running for 7 months now. This tank has been a lot of fun, and a great learning experience. I finally decided last summer to stop being intimidated by all the dire warnings out there about how difficult salt tanks are and just try one. It has been great, and I am really enjoying the salt side of the hobby! 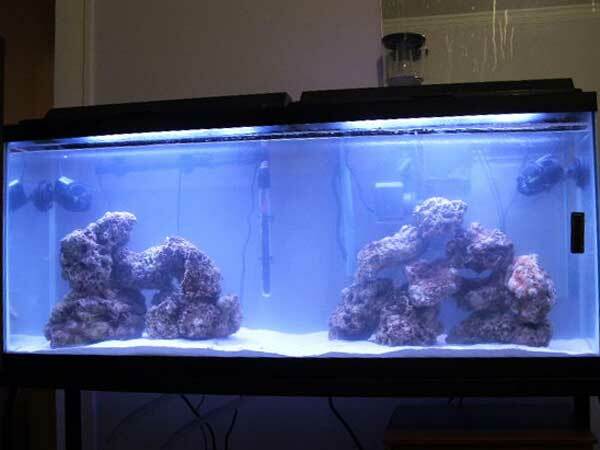 While there are certainly a lot more variables to deal with in a saltwater set up, I have also found that it is very possible to make the hobby much more complicated than it really needs to be. Learn the basics well, stick to a regular maintenance routine, and watch the tank flourish! 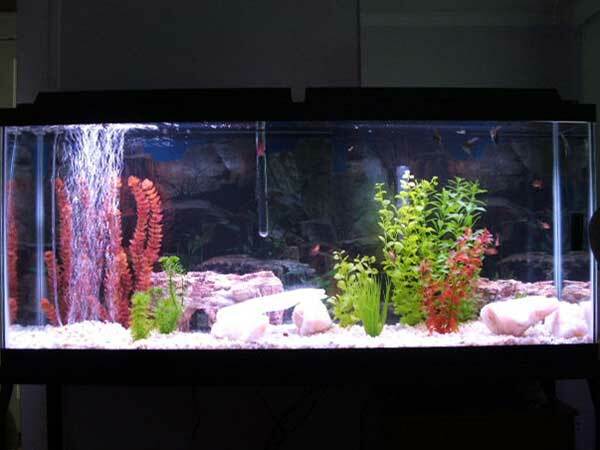 This tank runs on a Rena XP2 canister filter, visi-therm stealth heater, 2 Maxi-jet power heads, Coralife Superskimmer 65, and 130 watt dual satellite power compact lighting with LED moon light. In the canister I run Seachem Matrix and Seachem de-nitrate (both porous rocks for bacteria growth), along with a phos-zorb pad, and a micro filtration pad. Primary biological filtration is via 30 lbs of Lalo live rock. This tank gets a 5 gallon per week water change, and is kept at 78 degrees F. I add calcium to the tank daily, and iodine weekly. No other additives are used. The 55 gallon tank has long been a community tank housing koi angelfish, rainbow fish, and serpae tetras. However, I recently decided to make a change, and have just converted the tank to saltwater. Currently, it is still in the process of cycling, so no inhabitants yet, other than whatever may be lurking in the live rock. Currently, there is 45 lbs of fiji live rock, and I will be adding 20 lbs of tonga branch rock as well. 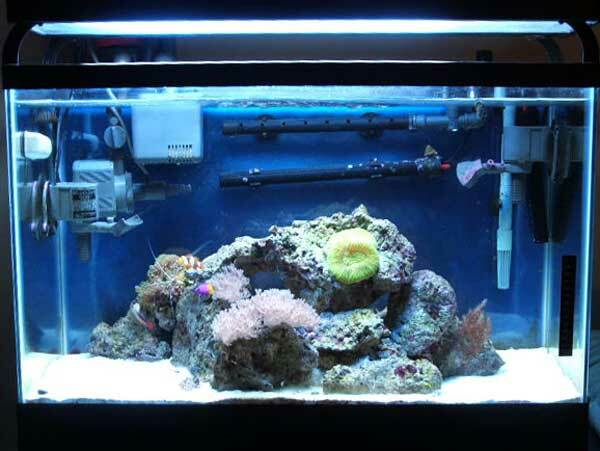 Equipment on this tank consists of 2 hydor koralia power heads, a Rena XP3 canister filter, a Coralife Superskimmer 65, and an All-Glass heater. The lighting is standard fluorescent right now, but will be upgraded to 432 watt T-5s with LED moonlighting in the next 1-2 months. 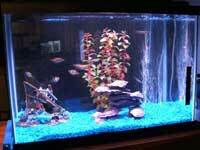 20 gallon tank: 3 Tiger Barbs, 2 zebra danios, 2 serpae tetra, 3 koi angels, 2 turquoise rainbow-fish, 1 bristle-nose pleco. Overstocked, I know, but only for a couple of weeks. 29 gallon tank: 1 percula clown fish, 1 purple firefish, 1 royal gramma, 1 skunk cleaner shrimp, multiple snails and hermit crabs. The tank also houses several corals: colt coral, umbrella xenia, starburst polyps, and green ricordea mushroom. 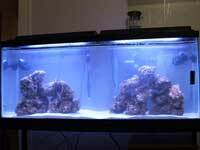 55 gallon tank: Tank cycling - no occupants yet. Will house a pair of yellow stripe maroon clownfish, and other as yet undetermined fish. This will also be a reef tank and will house a number of corals. I am planning a 45 gallon tank to relocate most of the fish from my 20 gallon tank into. 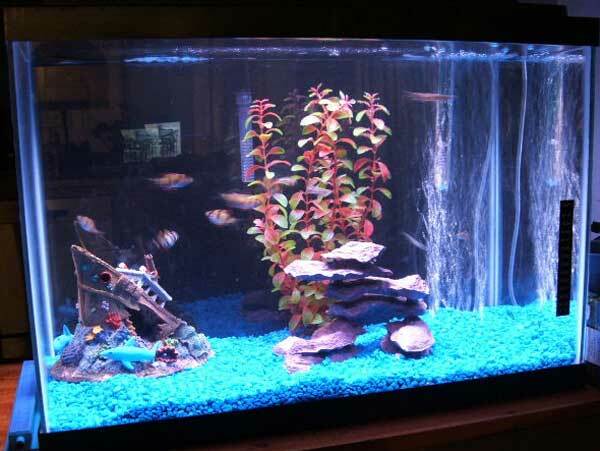 The smaller tank will then be re-done to more of a natural looking decor and will house a school of cardinal tetras. After that... who knows how long before MTS strikes again? I first have to acknowledge the patience of my wife, who does not fully understand my fascination with fish keeping, yet tolerates the time and money I have invested in the hobby with good humor. Usually. Of course, I must also acknowledge the Fishlore website and community. I shudder to imagine the state my tanks would be in if I had not found this wonderful resource and the wealth of knowledge, experience, and help brought by it's members.